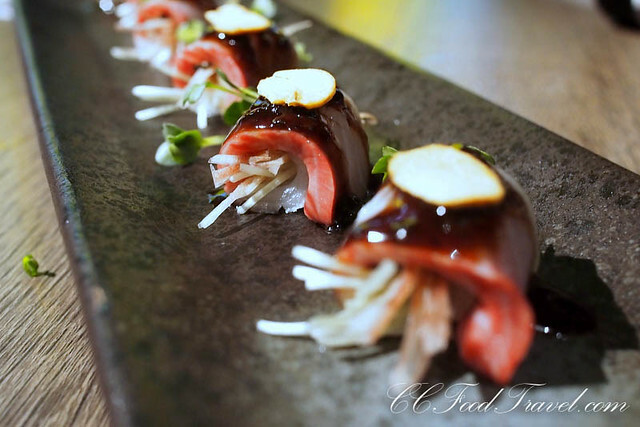 Dining at Kampachi is always an exciting affair. Especially since it is summer in Japan, and now, all the in-season dishes happen to be from the merriest season of the year. 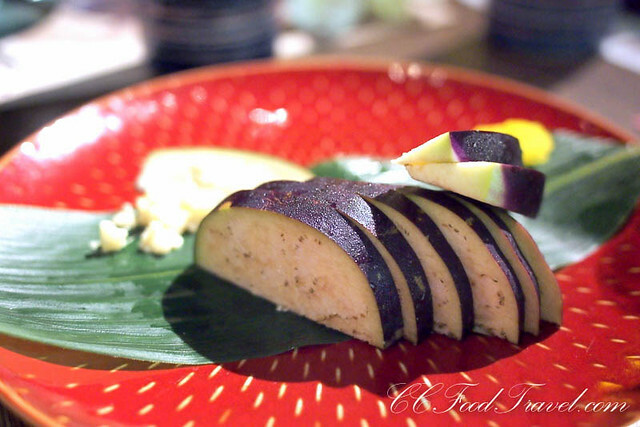 This Japanese water eggplant was probably one of the most simple yet delightful dishes to start off with. Raw and with very little else to complicate things, this crunchy vegetable was moist and supple – no trace of bitterness nor rough sap in each bite. Just pure, sweet bliss. 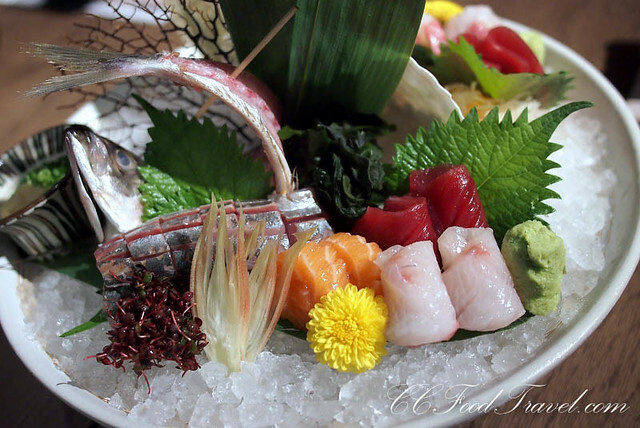 Still life – note the dancing Aji, or horse mackerel adorning the sashimi platter. This will later be fried up for our consumption. Fresher than a sailor return to shore, the Sashimi platters at Kampachi are always a pleasure to indulge in. This Carpaccio, was nice and taut… very fresh and exploding with aromas of ginger flower and pea sprouts. Flavours of lime, vinegar and soy, topped with garlic flakes gave it a nice kick. These ribs were marinated overnight with miso and grilled. 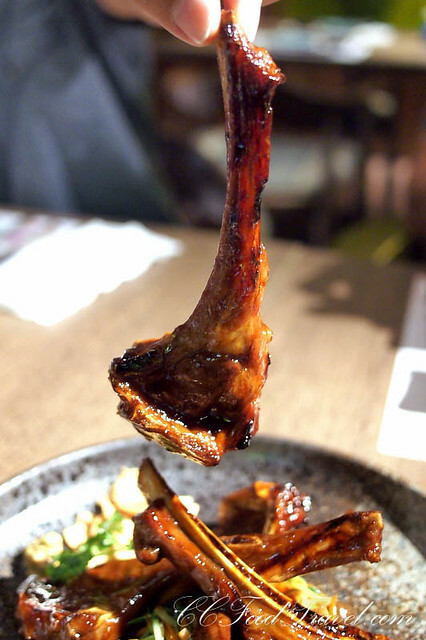 A sticky sweet and salty marinade which was irresistibly good, especially when you bit into the fatty bits of the lamb. The sauce was not too sweet and complemented the mustard and crispy garlic flakes it was served with. This dish comes highly recommended. 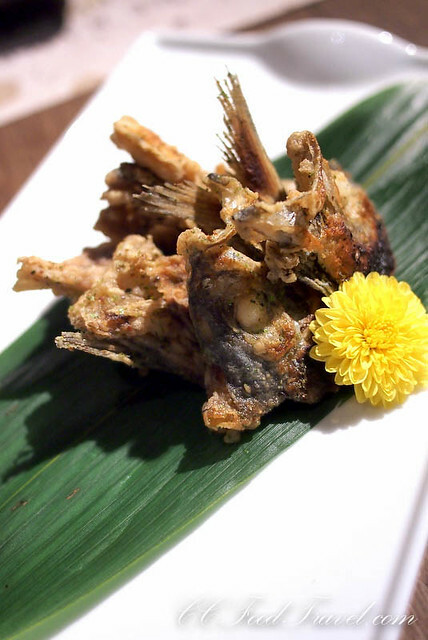 Part 2 – consuming the Aji : head and bones were then chopped up, dipped in a sake batter and deep-fried. Served to us as a crispy snack, this dish was to die for. Finally a dessert platter was served, which meant we didn’t have to crack our brains on what to order. 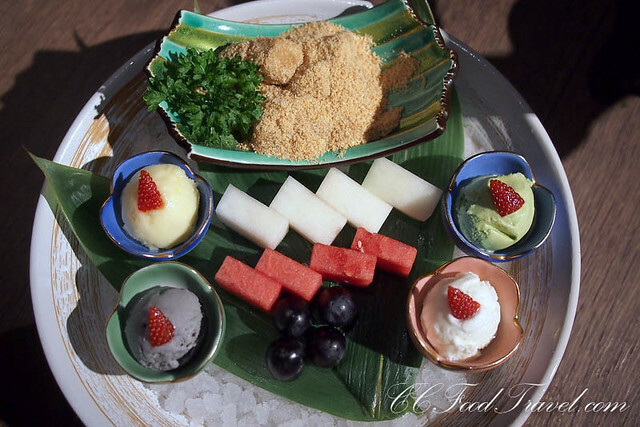 This platter had Abekawa Mochi and ice-cream, fresh fruits such as honeydew, watermelon and purple grapes. Apparently three types of peanuts were roasted and ground to make the nutty mixture of the sticky mochi. The ice creams served were goma or black sesame, yuzu and green tea. If you are a fan of great seasonal Japanese cuisine, check out Kampachi as they are currently having their Summer Delights promotion at Pavilion, Troika and Plaza 33. Dishes include hot summer favourites such as the Makogarei Kara Age or Deep-fried Marbled Flounder with Ponzu Vinaigrette, Isaki Sashimi, and Sazae Tsuboyaki or Simmered Japanese Turbo Shell with Mitsuba Leaf in Light Sauce and Ichijiku Age Dengaku or Deep-fried Figs in Tempura Batter with Miso Sauce. Never say no to Japanese Food. And I’m loving the shot of still life of the fresh cut sashimi .. <3 Best man! I love Japanese food. It can sometimes be spicy and mind-blowing, but always worth the pain LOL!